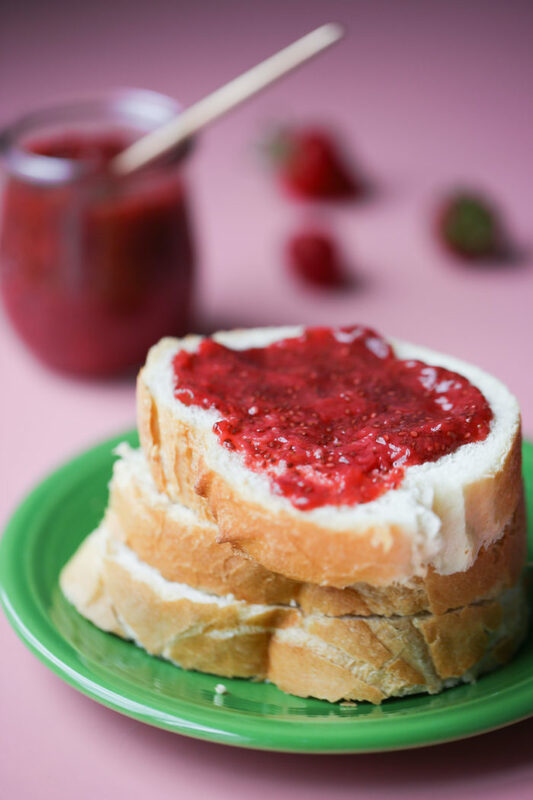 No fuss, no muss – this fruit spread is so easy to make and nearly impossible to screw up. Plus, it’s fresher tasting, calls for very little sugar, contains nutritional-powerhouse chia seeds, and have I mentioned it is SO EASY?! Chia seeds are such amazing little things. Packed with omega-3s, these little guys can soak up about 10 times their size and weight in liquid. Which is not only intriguing, but convenient, too! Because they develop a gelatinous coating after soaking in all of that liquid, and that makes chia seeds a most excellent thickener. 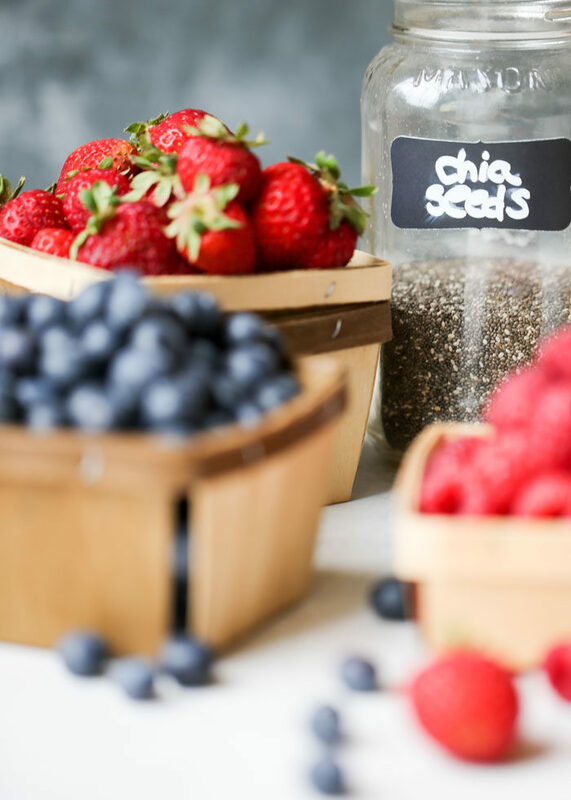 Chia seed jam is one of my favorite ways to enjoy summer berries and stone fruits. 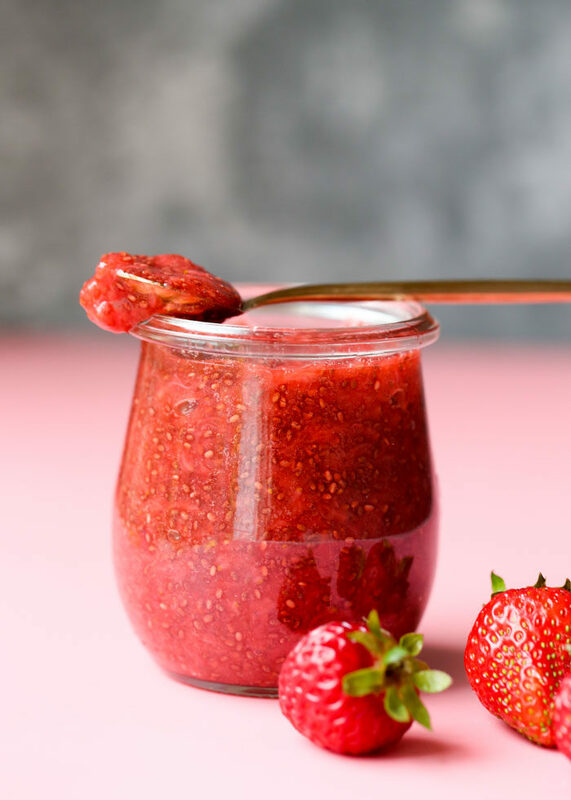 With just fruit, a surprisingly small amount of sweetener, and chia seeds, you can make a delicious and healthy “jam” that you can enjoy now or stash in the freezer for later. If you’ve never made it before, you might just be shocked and awed by chia seed jam and all of its awesomeness. The only downside to chia seed jam is, in my opinion, the fact that you can see the chia seeds in it – that might bother a few folks. That photo above, for instance, is strawberry chia seed jam. It looks like raspberry jam with those seeds, but nope! 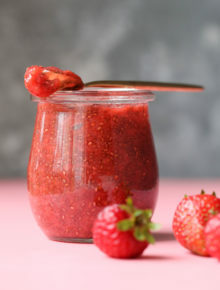 One thing you can do is puree your jam to help smooth it out a bit. But here in our house, we don’t mind the seeds. So are you ready to learn how to can make chia seed jam? Let’s do this thing! 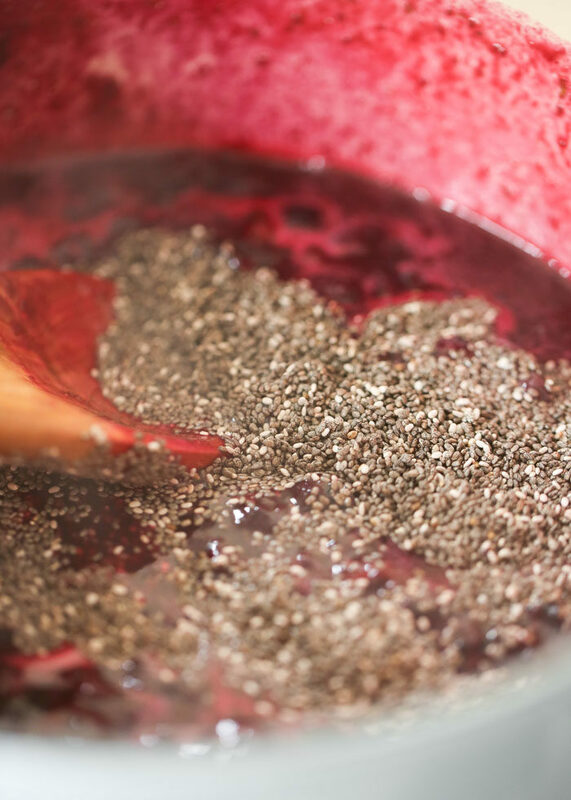 First, I’ll share my basic formula for chia seed jam; then, I’ll break it down step-by-step. From there, I might add a bit more sweetener or more chia seeds to get the right sweetness and thickness. It all depends on the type of fruit you use, but this formula always gets me pretty close. Sort through your fruit or berries and make sure it’s in good shape – not underripe or past its prime. Wash, hull, and quarter strawberries if you like; clean blueberries and discard any stems; peel, pit, and dice stone fruit. You get the gist. Bring the fruit to a boil and let it cook until it liquifies, about 5 to 15 minutes, depending on the fruit. If needed, carefully mash the fruit with a potato masher or fork until it’s at a consistency that looks good to you. 3. add the chia seeds! 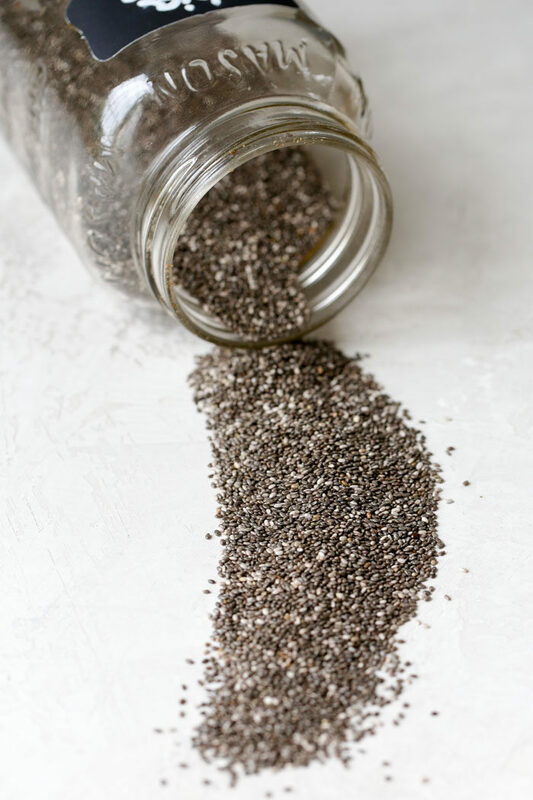 Stir in two tablespoons of those glorious chia seeds and remove from the heat. And then? Just let it sit so that the chia seeds can work their magic, transforming into an incredible fruit spread. 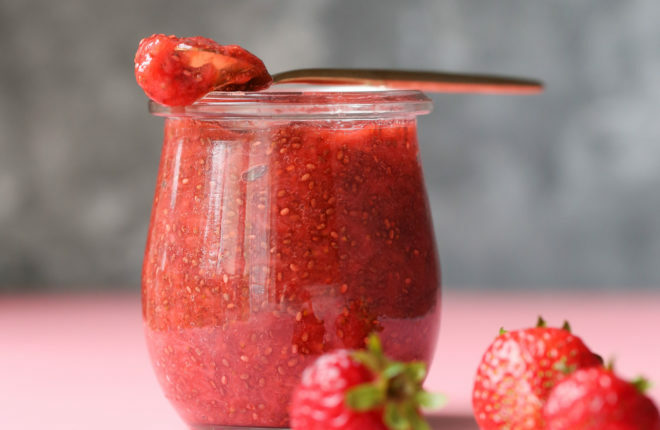 After about 10 minutes, your chia seed jam should have thickened up fairly well (and keep in mind that it will continue to thicken as it cools). But if the jam seems a bit thin, just add another tablespoon of chia seeds and let it sit for another 10 minutes until thick. Don’t worry – it’s really hard to screw this stuff up! 4. let cool, store, and enjoy! Eat your chia seed jam just like you would any other jam. 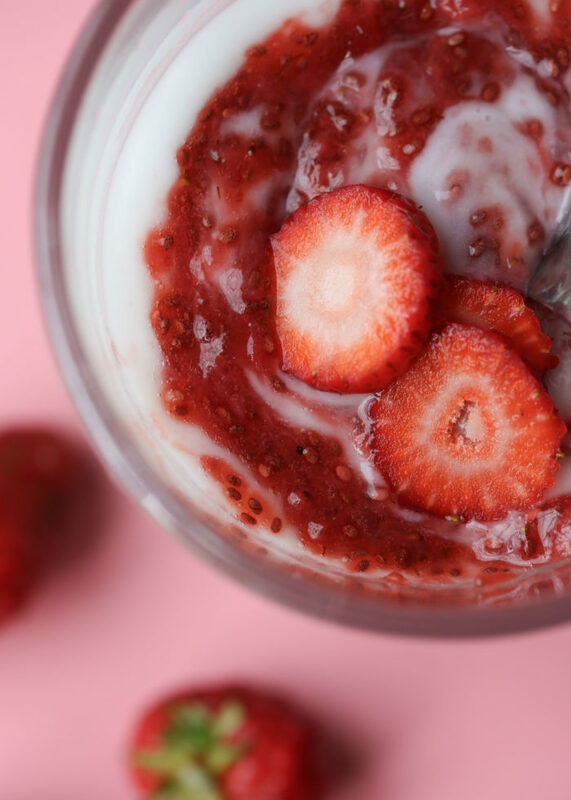 I love a dollop of chia seed jam on top of my oatmeal or swirled into yogurt. And, of course, slathered on a big ol’ slice of bread. To store, place it in an airtight jar with a lid and refrigerate for up to two weeks. And that’s it! That’s how to make chia seed jam! Are you a convert like I am? I’d love to hear how you like it – scroll on down and leave a comment and rating below! And here’s the printable recipe. Clean fruit, removing stems/seeds as needed, and cutting into smaller pieces if large. Place a medium saucepan over medium heat. Add the fruit and sweetener (if using – start with a little; you can always add more later). If you’re not using sweetener and your fruit is relatively dry, try adding a small splash of water to get the fruit going. Heat fruit, stirring occasionally, until it comes to a boil. Let it continue to boil until it begins to break down and form a sauce, 5-15 minutes depending on your fruit. If nccessary, carefully mash fruit with a fork or potato masher until it reaches the consistency you’d like. Taste and add more sweetener if desired, a little at a time. To store, place in an airtight container and refrigerate for up to two weeks. Can also be frozen for up to two months. * I’ve also made this without any sweetener at all – it all depends on your taste and the type of fruit you use! I do not recommend canning this jam – I don’t know how much the chia seeds might throw off the pH of the jam which, in a nutshell, could lead to bad things. I do like to keep small batches in the freezer to pull out once summer is long gone. Love your chia jamming. Great idea ! Thank you !